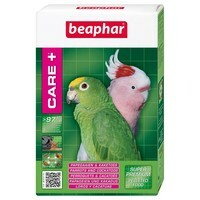 Beaphar Care+ for Parrots and Cockatoos has been specifically tailored to meet the nutritional needs of both Parrots and Cockatoos. Comprising of only organic ingredients, Beaphar Care+ offers an innovation in feeding these particular breeds of bird. Each bird's nutritional requirements are different and depend of their size, activity, housing, temperate and weather conditions. This complete, premium bird food should be introduced into the diet slowly, firstly mixing with the bird's current food. Approx. 20g per day = 2 scoops. Wheat, Maize, Triticale, Barley, Starch, Lupin Hulls, Dandelion, Rosemary, Oregano, Rosehips, Orange, Lemon, Whey Powder, Soy Bean Oil, Sunflower Seeds, Sesame Seed, Flax Seed, Molasses, Potato Protein, Peas, Carrots, Spinach, Alfalfa Meal, Kale, Broccoli, Pumpkin. Other ingredients; (2.7%): Calcium Carbonate, Dicalcium Phosphate, Sodium Chloride.